The long rumored Google Chrome Browser (Beta) release is supposed to be today (read it in several posts/blogs on the net)! Attached a vid of it...hope it works! I don't know if I'll give up my FF3 so quickly, and in general I'm really wary of Betas, but this looks interesting. And on another happy note, a gift to my friends here at WC: 10 super fun add ons to Google Earth! That's what Google has been doing for years. It knows how to make good web apps and desktop apps because it knows the user and enables the user to do what he/she wants to do, because Google knows what the user wants to do. Pix: When I posted, the video worked (I tested it). I was sort of amazed folks didn't respond to the post for so long... Anyhow, I'm thinking that this "Browser" is going to turn Google into a portal (like aol). If I'm wrong, I'll be glad! I think that the more open code stuff out there, the better the web becomes. Betcha FF3 is gonna end up using parts of Google's technology. Glad you saw my post. Like your comments and learn from them! Philly...Hi! Maybe we don't need another browser, but without the competition, where would we be? Lotsa products makes the producers work harder for your buck (at least in theory ). Please keep the post going. Anyone out there get a better peek at it? So far every Google app I've tried is a complete waste of time, although their services are great. So, Google itself announced the browser through a classic comic. What about the other link...re Google Earth? Any thoughts anyone? I've put the Hurricane tracker on my Google Earth and it's very good! Winlover41, it's not Gecko-based. I think it's WebKit based. Google Chrome is an open source web browser developed by Google. 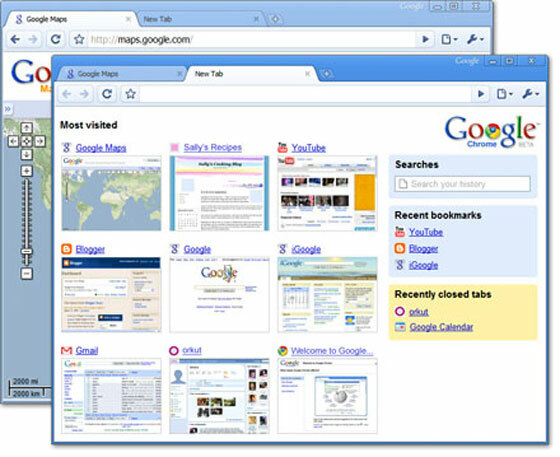 It is named after the graphical user interface frame, or "chrome", of web browsers. Google Chrome builds on components from other open source software, including WebKit and Mozilla, and is aimed at improving stability, speed and security with a simple and efficient user interface. Haha...another skin idea! Maybe someone who can make WB skins might be able to make a completely Google-ish OS skin [e digicons] [/e] The whole browser UI is very cool, all blue and Aero-ish [Without the M$ transparency]. Why? It's using WebKit so if stuff renders fine on any site you create in a WebKit based browser already you're fine. You might want to read thw fine print of what you agree to when you use the browser. Sorry about the bad link in previous post. I like this new broswer by google. It would make a cool WB6 skin! It's in beta so ofcoure it's not going to be very pretty or usable and definately not skinnable, yet anyways. Give it some time. Very interesting, Ken. I've tried it out, and it is VERY intuitive, and while fast, it is not that much faster than FF3. If those suckers steal any of your ships, the old Abbot and Costello routine comes to mind: "Slowly I turn, step by step..."
the old Abbot and Costello routine comes to mind: "Slowly I turn, step by step..."
On the GUI side I would agree but, most of the their own hype was on how usable and stable the it is. Yes, it's stable but, far from usable IMO. Not to mention it intermittently crashes when I close the last remaining tab. As for the claims to low memory footprint I'm not seeing that. If their goal is towards web based apps than they shouldn't promote it as a browser because so far it's failed.